As the inventors of outstream video advertising, at Teads we’ve taken a close look at our campaigns to investigate the state of outstream in the video market. By choosing to advertise this way, brands are considerably increasing their ability to reach their target audience. Currently, video viewing only accounts for one third of time spent online. There has to be an alternative way to reach consumers, and the answer is outstream. The research supplements the recent report by Forrester Consulting, which indicated the huge appetite that advertisers, brands and publishers have for video, especially outstream. Notably 77% of advertisers, 70% of agencies and 60% of publishers predicted that outstream will become a more common part of the video mix. To illustrate the impact, we have analysed quarterly industry and Teads data to provide insights into this ever-expanding sector of the video advertising industry. With 1593 campaigns delivered in Q1, this analysis looks at 12 countries, including: Argentina, France, Peru, Brazil, Germany, Spain, Chile, United States, Italy, UK, Colombia and Mexico. This year at Cannes we will be debuting more ground-breaking research. Keep your eyes out for further updates. 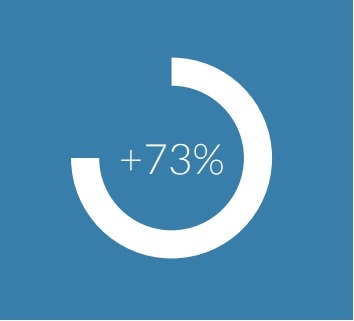 Compared to Q1 2014, outstream video advertising in Q1 2015 achieved a 73% spike in delivered completed views. 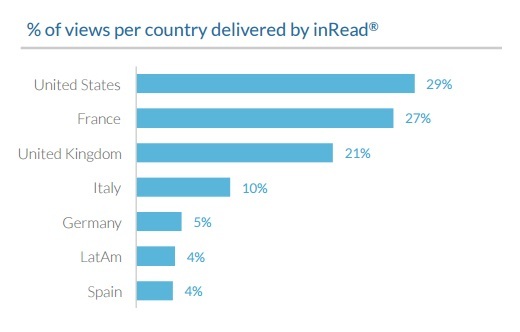 In the same time, the number of completed views delivered on inRead® has increased by an incredible 454% – with the USA taking the top spot, closely followed by France. The MOAT benchmark was 54.4% for viewable impressions in Q1. Using the MRC definition for viewability, Teads’ outstream videos achieved 93% visible impressions. Designed to engage, not enrage, outstream outperformed instream on click and share-through rates, as well as viewability. is equivalent to 2.16X the number of views bought, as the graph above indicates. internet brands perform above average on CTR. Videos over 30 seconds long represents 23% of total views served in Q1 2015. Those lasting 36-60 seconds and 11-15 seconds had the highest CTR, while videos over 100 secs, between 61-100 secs and under <10 secs had the highest number of views. Find out more about Teads research and download the full outstream report here.